Camelot is dying. There have been visions of The Holy Grail that will heal the land of its affliction, but three brave knights have gone to search for it and never returned; it falls to Arthur to complete the quest and save his kingdom. In his quest for the Grail, Arthur will travel to exotic places and face tests of courage, skill and wisdom - for the Grail is not a prize to be won lightly - only to one truly worthy will it reveal itself. From the magical kingdom of Camelot to the Holy City of Jerusalem and beyond, players will live the experience of Arthur, as he sets out on a quest that will require more loyalty and more courage than any man has ever been asked to give. If he succeeds, his kingdom will grow strong and joyful once more - if he fails, all is lost. 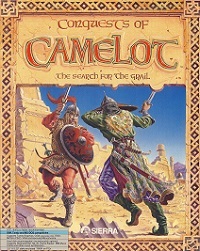 - Historically accurate, yet filled with the myths and lore of legendary Camelot. - Beautiful graphics and superior sound capabilities for ultimate enjoyment. - Arcade-type sequences include a joust with the Black Knight and a battle against the Mad Monk. - Geographically accurate maps of ancient Britain, featuring detailed descriptions of historical and mythological points of interest.